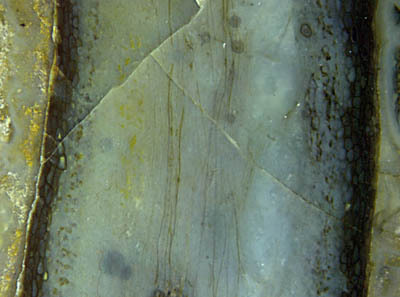 Conspicuous voids in the tissue of early land plants from the Lower Devonian, like those in Fig.1, had been interpreted as shrinkage cracks in the dead and decaying plant . Closer inspection of the voids gave rise to doubts. Evidence has been found which indicated that the voids were present in the live plant and had been the result of a growth anomaly, as explained in Rhynie Chert News 4, 21. Since this interpretation is not yet widely known, additional evidence is presented here. 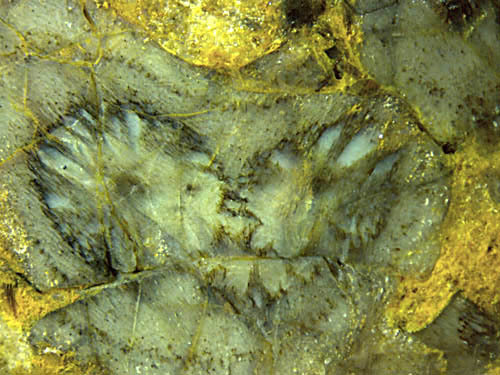 Fig.1: Inclined cut of Aglaophyton above the forking site of the xylem but below the forking site of the shoot, with growth anomaly in the tissue visible as a void pattern around each prong of the xylem strand. Width of the picture 8mm. Evidence for the intricate relationship between early land plants and fungi is quite common in the Lower Devonian habitat known in a well silicified state as Rhynie chert. Cells with dark fills seen on cross-sections as a concentric ring are due to a phenomenon known as arbuscular mycorrhiza, which is usually regarded as a kind of symbiosis . They are seen here as dark dots loosely aligned at some distance from the circumference (which is non-circular near the forking site). This shows that some fungus was present in the live plant. More evidence for the presence of fungi in live specimens of early land plants is provided in Figs.2, 3. Fig.2: Rhynia, diameter 1.5mm, affected by fungus. Another type of fungus invasion is seen in Fig.3, where hyphae had grown in an essentially parallel way along the shoot of Aglaophyton where they are faintly seen now. Here the central strand had been above the cut plane and hence cut away. For reasons unknown, most of the tissue had vanished so that the hyphae are better visible here than in the presence of tissue. If they had grown in the dead and decaying plant, they would more probably have grown in any direction, hence the parallel alignment seems to indicate that they, too, grew in the live plant. 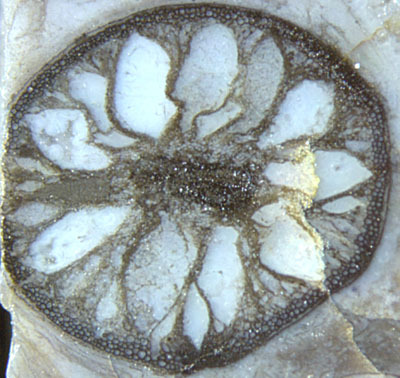 Fig.3 (right): Aglaophyton shoot, diameter 4.5mm, apparently hollow, with faintly seen hyphae arranged lengthwise. The abundance of fungi met in the early land plants , be they symbionts or parasites, suggest that they may be responsible for the big and small holes in the tissue which cannot be ascribed to shrinkage or herbivory. This idea is supported by the rare cases of two roughly mirror-symmetric void patterns ("twin patterns"). Previously presented evidence has been based on separate "twins" but Fig.1 shows the twin patterns before separation. They could hardly form independently but can be explained as having been transferred from the base of a forking shoot into the growing prongs of the fork. (This applies also to Rhynie Chert News 55, Fig.1.) Hence, the voids are very probably due to misguided growth triggered by substances released by a fungus, and discussing void formation in live plants as a subject of taphonomy as done in  is severely erroneous. Now that an explanation of the voids, contrary to established views and with the help of twin patterns, has been proposed here, a particularly conspicuous flower-shaped pattern is shown here just for its beauty (Fig.4). This seems to be an extreme case of misguided growth but it is also thinkable that the pattern is the result of more than one process stage. Judging from the aspect of the tissue along the circumference, the plant could well have been alive while its interior was reduced to several strings keeping the central strand suspended in the centre. 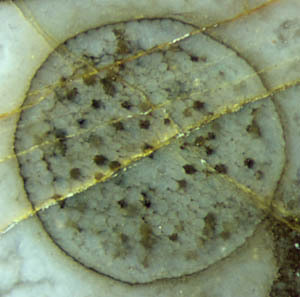 Fig.4: Aglaophyton cross-section, 5mm, with conspicuous void pattern.